If you don't know a shillelagh from a Shamrock, this page should help you get your green on for St. Patrick's Day and not sound like a complete Mickey! Click on the links for more information. Erin go Bragh or the Irish language phrase, Éirinn go Brách, means "Ireland forever" in Gaelic.and is used to express allegiance to Ireland. Guinness - An Irish beer, specifically a stout, a dark, strong flavored beer. 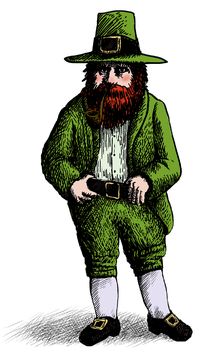 Leprechaun - small Irish fairies from Irish folklore, dressed like the bearded Keebler elves, about three feet high, with pointed shoes green vest and hat. Shillelagh - a walking stick carried by a leprechaun (pronounced shill-lay-lee). Sláinte - Sláinte is the Gaelic word for health; so "good health!"